Summer weather on San Juan Island is extremely pleasant with average high’s in the 70's and cool, refreshing nights. Most of the time. 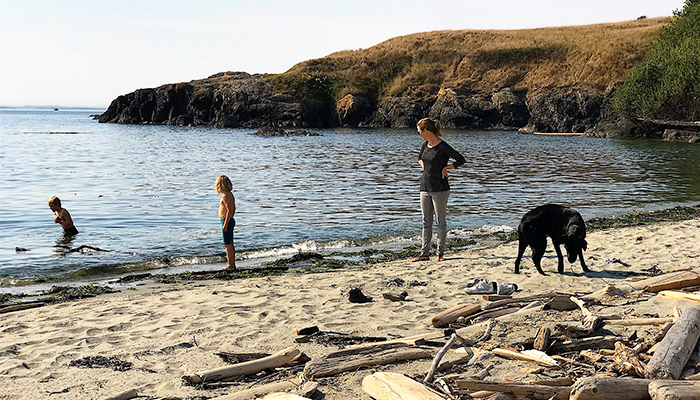 Every once in a while though the isle experiences a heat wave during July or August and that’s when you need to know your best places to beat the Summer heat on San Juan Island. Most hotels on San Juan Island don’t offer rooms with A/C, because quite frankly it’s not necessary. If air conditioning is important to you or you know you’ll be staying during an exceptionally hot week, check into the Earthbox Inn & Spa. Earthbox features two room styles with A/C (Sun and Water Places) and is the only hotel on the island with a gorgeous indoor pool and shady pool patio to cool off. It’s always 10-15 degrees cooler out on the glistening Salish Sea. Go on a whale watch trip with our friends at San Juan Safaris during the hottest part of the day. 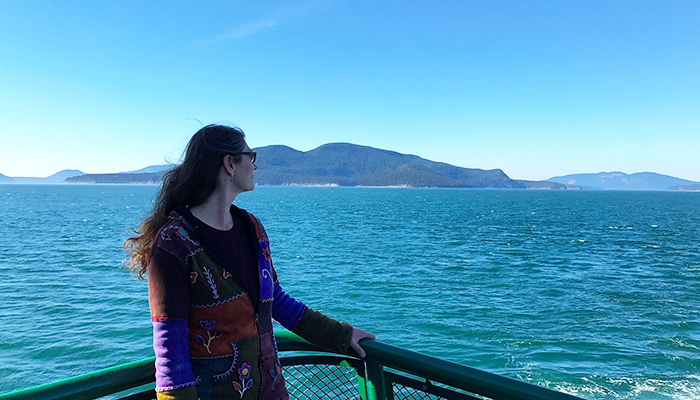 Or hop on the (free for foot passengers) interisland ferry and sit on the deck in the wind and take in the breathtaking views. Downriggers Restaurant by the waterfront not only offers excellent Northwest Cuisine, it also has A/C in their light, spacious dining room and a huge, wrap around deck overlooking the Friday Harbor Marina. The adorable San Juan Islands Museum of Art with its architecturally fascinating foyer and rotating exhibitions centering around the Pacific Northwest, authenticity of expression, place, and connections, is a highly inspiring way to spend a few hours out of the sun. All three galleries have A/C. English Camp National Historic Park in the north of San Juan Island, nestled around pristine Garrison Bay, is densely wooded, hilly and rich with history and wildlife. Go on a leisurely, shady hike around Bell Point or climb scenic Mt Young. Tour the historic camp grounds and barracks, the formal English garden and officer’s graveyard or have a nap in the grass in the shade of a majestic, native Garry Oak. Cool off with a Porter Float and free live music at Friday Harbor’s newest brewpub. 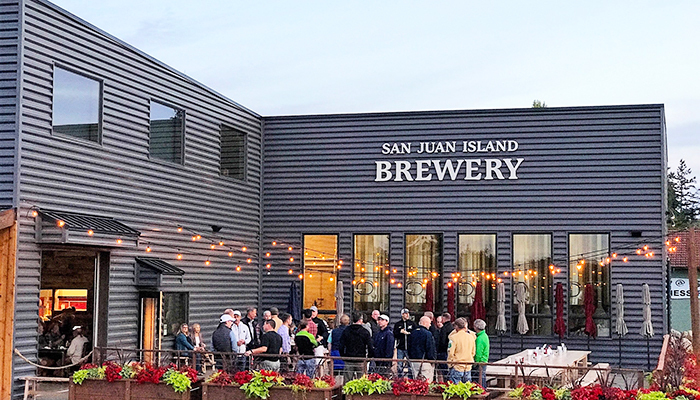 San Juan Island Brewing offers A/C, a view of their shiny microbrewery, seven plus ales brewed on the premises and delicious pub fare at their airy, comfortable locale. Giant garage doors open to ample outdoor seating to enjoy balmy Summer evenings. The waters around San Juan Island are a chilly 50 degrees even in the height of Summer. There are some shallow bays though, which heat up nicely on warm days and are calm enough for a fun, safe splash. Grandma’s Cove, a 0.3 mile stroll through the prairie from the Interpretive Center in American Camp National Historic Park, is such a place. One of the few sandy beaches on the isle and protected from wild waves and wind, this is the place to be for a perfect day on the beach. The air-conditioned Bean Café in downtown Friday Harbor is a lovely, relaxing spot to enjoy an organic, fair trade cup of joe, handmade salted caramels, mouthwatering pastries and sandwiches. Revel in the beautiful, local art on the wall, play a game of Mancala (with coffee beans instead of stones), enjoy free Wi-Fi and a ferry cam so you don’t miss your boat. Park at Jakles Lagoon in American Camp National Historic Park and hike the three-mile loop trail through thick forest to the top of Mt Finlayson. After leaving the lagoons behind and a particularly steep stretch, you’ll emerge from the windswept forest amidst high Prairie grass and the most astonishing views of Mt Baker, Cattlepoint Lighthouse, South Beach, the wild Strait of Juan de Fuca, the Cascades and the Olympic Mountains. Enjoy the cool breeze, have a picnic on top of the world and watch birds. Zip line up to 60 feet above ground through shady, old growth Douglas Firs and over a lake in the heart of San Juan Island. The zip lines get higher, faster and cooler the deeper you get into the forest. Conquer all eight lines and a suspension bridge on the family friendly, super fun, three hour tours offered by Zip San Juan.